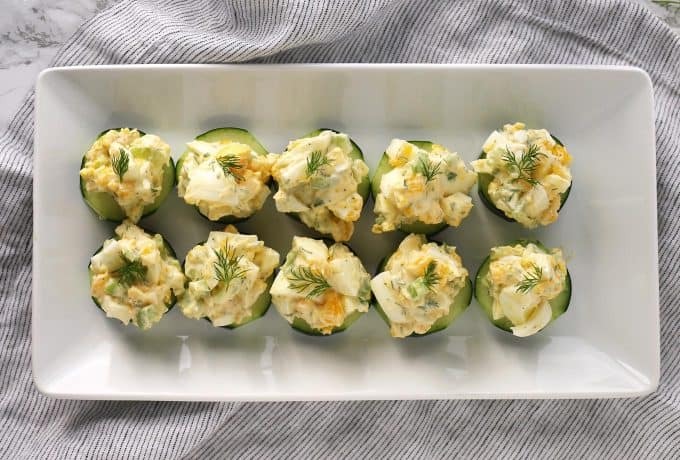 This egg salad cucumber canapé recipe is the perfect appetizer for Easter and Mother’s Day brunches. It is gluten-free and dairy-free and can be made in just 10 minutes. With Easter and Mother’s Day coming up, brunch recipes are at the top of my mind. Egg bakes and quiches are great main dishes but I am grazer; finger foods are my favorite! There is nothing better than a bite-size appetizer to get the party started. 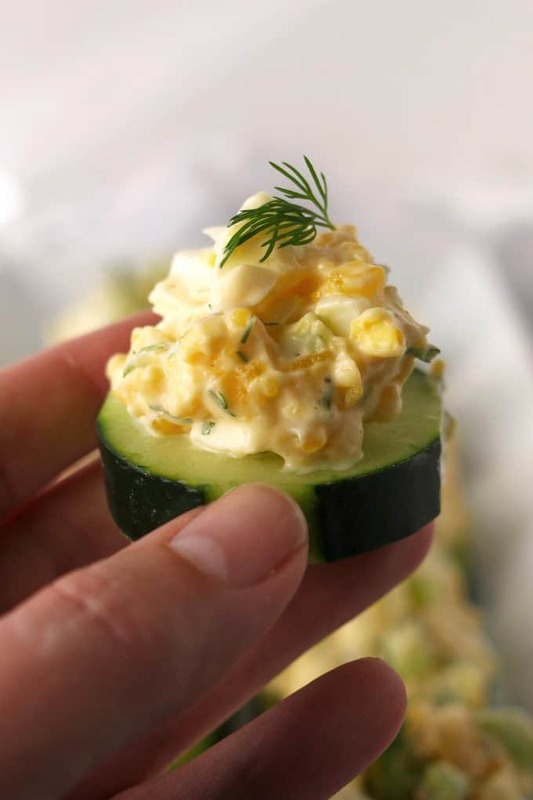 A one to two-bite hors d’oeuvre was my goal with this egg salad cucumber canapé. It’s not only delicious, these are easy canapés to make ahead. The first thing you need to make this easy recipe is egg salad. I always steam my eggs to hard boil them. I find this to be the fastest way to get an easy-to-peel hard boiled egg. 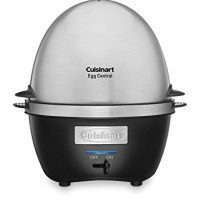 To steam your eggs, put about 1-inch of water in the bottom of a pot. Add your eggs to a vegetable steamer and then add the steamer to the pot. Place the cover on top and place it on the stove. 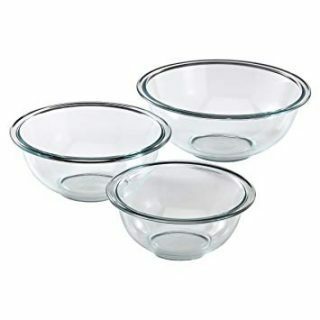 Turn the heat to medium-high and steam them for 11-12 minutes. When they’re done, remove the entire steamer and place it in the sink under cold running water. Before you know it, your eggs will be cool enough to peel and you can get started. Chop them up and add them to a medium bowl along with mayo, dijon mustard, diced celery, dill, salt and pepper. We always use light mayo. Of course, feel free to substitute regular mayo if you wish. Stir all of the ingredients together with a spatula and then set the bowl aside. Grab a vegetable peeler and your cucumbers and peel the cucumber skin. I like to do this in 4 sections for decoration. Cut the cucumber into 1 to 1 1/2 inch slices and then get ready to make your canapés. Use a tablespoon to pile some of the egg salad on top of each cucumber slice. 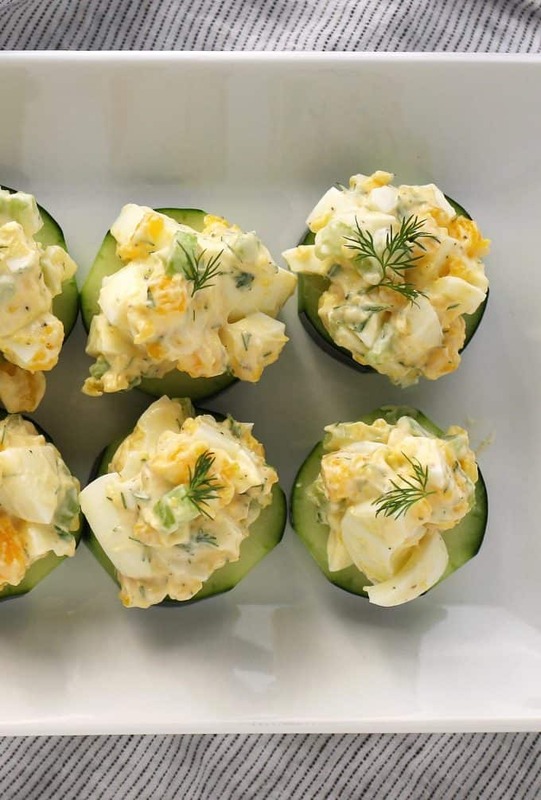 Use your fingers to make sure that all of the egg salad stays on the cucumber and garnish with a sprig of dill. You are going to want to add this easy appetizer to ALL of your parties and brunches. You are probably going to want to make this for lunch too. Canapés are the perfect tiny appetizer or finger food. Traditionally, you start with a small piece of bread or toast and add toppings. For this recipe, we are using cucumber slices instead of toast for the perfect gluten-free brunch treat. If you have gluten-free or dairy-free friends and family, you may have struggled with adding items they can eat to the menu. I know I have – I usually make my mom’s potato egg salad but this is a delicious substitution. 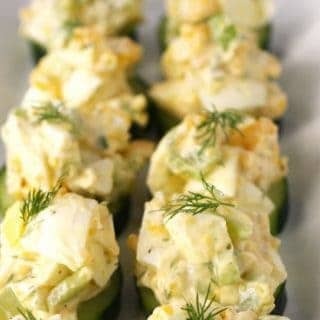 This egg salad cucumber canapé recipe is perfect appetizer for Easter and Mother's Day brunches. It is gluten-free and dairy-free and can be made in just 10 minutes. Peel and dice the hard boiled eggs. 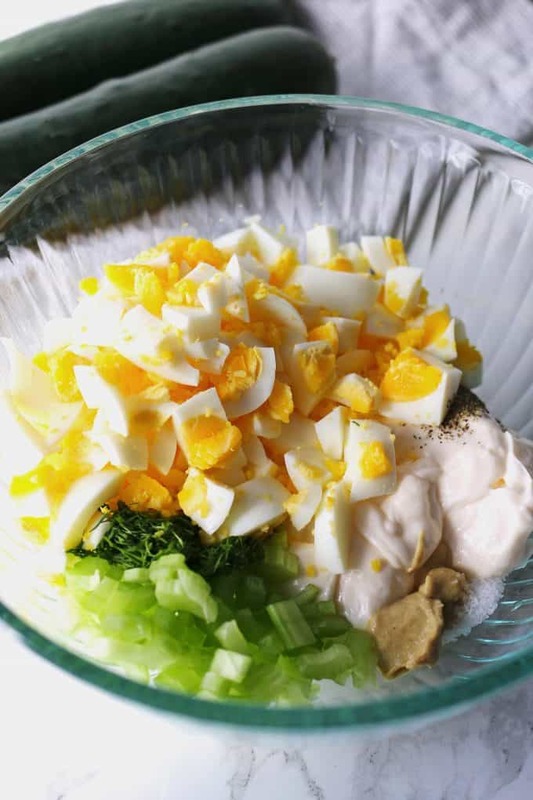 Place the eggs, light mayo, celery, dill, and dijon mustard in a medium bowl and stir well with a spatula. Season to taste with salt and pepper. Peel your cucumbers if desired; then cut them into 1 inch to 1.5 inch slices. Place one tablespoon of egg salad on each of the cucumber slices. Garnish with additional dill sprigs. Check out my other recipes using eggs! These are perfect for any time of the day, anywhere with anyone! 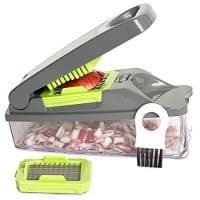 Especially perfect for Mother’s Day if you’re preparing something special! The cool crisp cucumber instead of bread, is what puts this over the top for me. I could probably eat all of them myself. Love canapes and these are the perfect little party appetizer! The look delicious! These are so cool! I love how delicious they are and how easy they are. Perfect for a bridal shower or baby shower. Canapes sound so fancy! Something me and the girls would daintily eat at the club. If there were “the girls or the club” LOL! Seriously, they are so pretty and would make a great finger food for brunch or as an appetizer! I love that you used cucumbers too. Mmmm! This looks sooo good!!! Love it!!! So perfect and elegant for entertaining! These look amazing. Love the little delicious bite and that you’ve paired it with cucumber, keeping it bright & fresh! 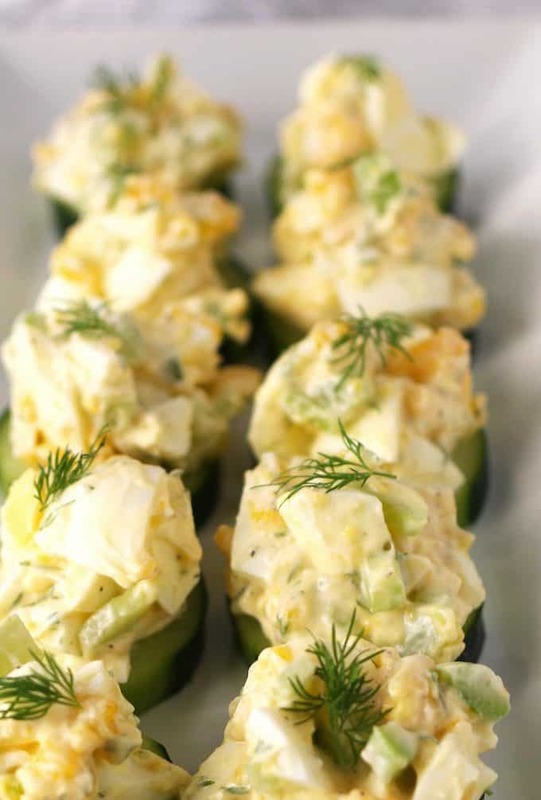 I love egg salad and cucumbers — this is such a perfect appetizer!! These are the BEST little bites! I could make an entire meal out of them! These look fabulous! 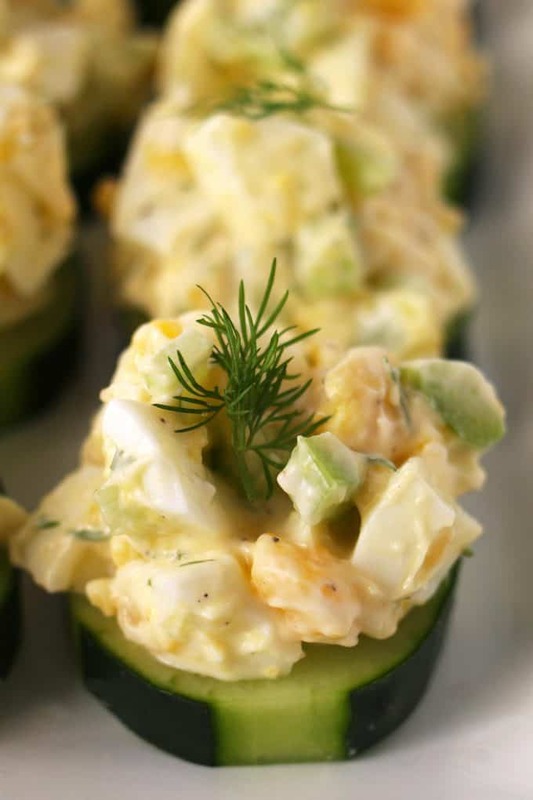 The crunch of the cucumber combined with the creamy egg salad are the perfect bite! I never thought to put the two together. DELISH! I love how fresh and light this is! So looking forward to making it very soon! Loving the addition of the cucumber! Makes it feel so fresh and crisp! I love that you steamed the eggs instead of boiling them. I have the hardest time getting my hard boiled eggs to come out right. I never get them to cook each time I make them. I love the idea of these canapes on cucumber slices. They are perfect for Easter and Mother’s Day!